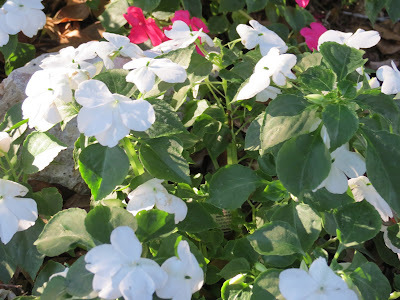 With the freeze warning in effect last night for sunny Florida, I spent late afternoon bedding down the flowers with blankets and quilts to keep them warm through the cold night. The backyard looked like a sleep-over with all the lumps and mounds of covers. I also called on the Angels to watch over the garden. It was well worth the effort. The impatiens were smiling this morning when I uncovered them to greet the sunrise. So it is with life, often we have a "heads up" that things aren't going to proceed as usual. Extra care is necessary to sustain one's comfort zone in the physical as best as we can. Then prayer and meditation are the keys to letting go of attachments and letting things be as they are. The rough patches in life are a call for more love. If everything we do is in a spirit of love, then think how much better this world would be.